Beetles, mosquitoes and flies, oh my! Not many people like to deal with creepy crawly bugs, especially in and around their home. Each season brings new insects that can destroy landscaping, bite people and pets and spread disease. According to Ohio State University, Americans spend more than $3 billion each year on pest control services alone, while another $400 million is spent on DIY applications. Fortunately, pest control doesn’t have to come from the use of harsh chemicals. Many natural plants and herbs can repel these pesky pests and provide many other benefits. Mint has been used for centuries to preserve food, deodorize rooms and ward off insect infestations. This non-toxic, eco-friendly plant is particularly useful at keeping ants, mosquitoes, fleas, cabbage moths and flies at bay. All species of mint, both cultivated and wild, contain aromatic properties that are repulsive to pests. 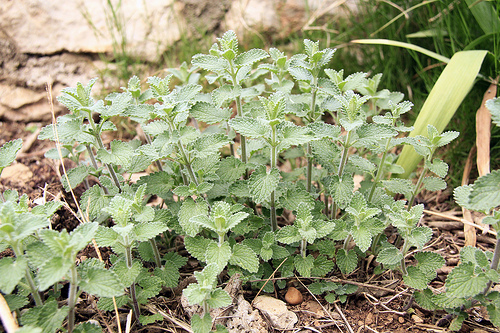 When mint is brushed or crushed, the pungent scent is released. Pleasant to your senses but offensive to your small, unwelcome guests. Mint is an invasive plant and can become problematic in garden beds as it competes with other plants for space. If you wish to grow your own mint, keep the plant confined in a garden pot or place leaves in sachet bags around your home. While catnip may be useful at driving your feline crazy, the perennial herb has other excellent uses. According to researchers at Iowa State University, the essential oil in catnip that gives the plant its unique odor is approximately 10 times more effective at repelling mosquitoes than DEET, a compound used in many commercial insect repellents. If you grow catnip yourself, the stalks and leaves can be used to create a catnip bug spray. DoItYourself.com suggests stripping the leaves from the stalk and putting them into a food processor, while the pulp goes into a pot. Add two cups boiling water to the catnip, let sit for 10 minutes and strain the leaves. Keep the mixture in a spray bottle in the refrigerator and spray when needed to keep pests away. Garlic not only repels troublesome vampires, but its distinct odor is also revolting to insects. This powerful natural bug repellent can help eliminate mosquitoes, Japanese beetles, Mexican bean beetles, aphids and winged ants. According to Patrick Parker, SavATree Plant Health Care Program Director, one treatment with garlic can repel bugs for up to one month. To keep insects out of your garden, create a border of garlic plants around the perimeter. Garlic sprays can be made by peeling and crushing cloves of garlic. Place the garlic in a covered container with one gallon of water, one minced onion and a tablespoon of cayenne pepper and let sit for two days. Strain your new garlic repellent into a spray bottle and use as needed. While delicious in pesto and salads, basil is also a highly efficient way of keeping your home free of flies. The oils found in basil plants can repel a variety of insects, including thrips and mosquitoes. Basil can be planted next to doors and windows to keep insects out of your home or in a foundation planting mixed with flowers. This popular garden herb is often used in companion gardening, planted alongside tomato plants to produce tastier, larger tomatoes. Inside the house, basil can be planted in pots using seeds or store-bought seedlings and sat on window sills. Basil needs full sun and well drained, rich soil. Many people prefer to start their seed indoors and then move their basil outdoors after the last frost. This herb is sure to repel those bothersome flying insects both inside and out.